If you’re worried about hitting the wall, here are some fool proof tips on what to eat and drink during a marathon to ensure you make it to the finish line. You won’t have enough glycogen to fuel you 26.2 miles, so you’ll need to refuel en route. Start fuelling after about 60 minutes. Don’t wait until you feel exhausted or hit the wall otherwise your gut may reject the food and it will come straight back up. Check in advance where feeding and drinks stations are on the route, so you can plan when to refuel. At the 2019 London Marathon you’ll find water at the start and at a further 13 drinks stations along the route. There will also be Lucozade Sports Drink at the start and at a further five drinks station, and Lucozade gels at miles 14, 18 and 22. Only use what’s provided if you have trained with the products – don’t try them for the first time on race day in case they don’t agree with you. The ideal carbohydrate intake is 30 – 60g per hour, depending on your pace (and your gut). Elite runners will use drinks and gels containing a mixture of glucose and fructose, which allows them to absorb up to 90g per hour. There are no strict rules, but most runners will take on board fuel approximately every 30 – 60 minutes or every 5 – 8 miles. During the marathon, there are no strict rules about how much to drink as this depends on how much fluid you lose through sweat. The International Marathon Medical Directors Association suggest 400-800ml of fluid per hour, depending on your sweat rate. If you’ve practised a drinking strategy in training, you probably have a good idea how much to drink but if its warmer or colder than expected, then you will need to adjust your plan. Be flexible! Don’t drink excessively. Drinking more than you’ve lost increases the risk of hyponatraemia (low levels of sodium in the blood), which is a serious and potentially fatal condition. As a rough guide, aim to drink 125–250 ml –about two or three big swigs – every 15 to 20 minutes or according to thirst. You don’t need to drink at every drink station but don’t be tempted to skip them to gain valuable time, particularly on a warm humid day – dehydration later on will slow you down even more. Stick with whatever you have used in training and don’t try anything new. Before you go off and celebrate, you need to replace the fluid you have lost. Drink around 500 ml, little and often, in the first 30 minutes after the race, and then keep sipping every 5 to 10 minutes until you are passing pale coloured urine again. You also need to start replenishing your glycogen stores, ideally 1g carbohydrate/ kg BW. To promote muscle repair, include protein too (20g is the ideal amount for muscle building). Milk (dairy or soya) or other milk-based drinks or recovery drinks, yogurt, bananas, peanut butter sandwiches, home-made super-flapjacks, blueberry muffins or fruit and nut loaf are good options. Should I take caffeine during the race? A lot of runners like to use caffeine but only do this IF YOU’VE TRAINED WITH IT. It is tolerated differently by everyone and not everyone benefits, so don’t use it for the first time in a race. Caffeine is a brain stimulant; it may improve performance by lowering your perception of fatigue and pain. A general recommendation is 1 – 3 mg/ kg body weight, or about 100 – 200mg. You can take it as coffee, gels or pills. A single expresso contains 75mg, one caffeine gel contains 25 – 75 mg and caffeine pills 50mg (check the label though). It takes 30 – 60 minutes to peak in your bloodstream so you can either take your caffeine shortly before the start or towards the latter stages of a marathon if you want a boost for the final few miles. I’ll be speaking on Centre Stage at the Virgin Money London Marathon Running Show, London ExCel from 24th – 27th April. Its FREE entry! The show will feature lots of talks and interviews with celebrity runners! Click the link here for more information. Marathon Fuelling, Part 1: What to eat for Marathon Training, gives essential nutrition advice to help you get the most from your marathon training programme. If you enjoyed this post and want to find out more about sports nutrition, then check out my brand new book, The Runner’s Cookbook. 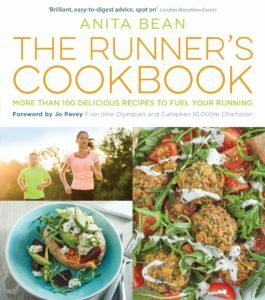 It features more than 100 delicious recipes to fuel your running. With a foreword from five-time Olympian Jo Pavey, the book also provides practical nutrition advice on fuelling before, during and after running, guidance on hydration and supplements, weight loss tips, how to recover from injury, and how to prepare for 5k, 10k, half marathons, marathons and ultra races.